If you’ve ever moved your business into a new building, you may have discovered too late that your dry storage room isn’t so dry after all—and improper floor treatment could be the culprit. Don’t let water, spills, floods and other unpredictable conditions destroy your flooring and anything underneath with water damage. With Florock’s waterproof epoxy flooring and coatings, you can easily prevent that type of unpleasant and costly experience. Damage from liquids can be easily prevented by having the proper commercial or industrial concrete floor systems installed on upper levels and wherever excessive water or other fluids may be present. Florock waterproof flooring and coatings are strong enough even for facilities that frequently mop or hose down their floors with water or chemical solutions, giving you the enduring strength you need to help keep fluids under control. The best part of choosing waterproof flooring from Florock? 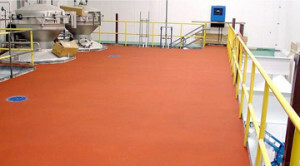 Any one of our many commercial and industrial concrete floor systems can be installed as a waterproof system. We offer impervious elastomeric waterproofing underlayments that are compatible with all of our other high performance Florock floors. This means you can benefit from the chemical, abrasion and slip resistance you expect from Florock, as well as a gorgeous finish of your choice and any other special properties you may need—all protected by a high functioning waterproof flooring system. It’s a beautiful thing. Gravity forces liquids to their lowest possible point—that means that if your concrete floor systems have cracks or vulnerable spots, water and other liquids will find them and seep through. Sometimes this means soaking through the porous grout of a tile floor, or trickling into hard-to-notice imperfections in the concrete. It may even mean that water trickles toward the wall, where it will seep through the seam between the floor and the drywall. The consequences? In many cases, it means soaking into porous wall board, sub-floor material and rafters, encouraging mold and bacteria to form. If that weren’t bad enough, liquids on an upper level can just as easily seep completely through the ceiling of the room below, causing massive damage to anything stored there. Even if your concrete floor systems aren’t typically exposed to liquids, accidents happen—and they can’t be predicted. A broken water pipe, a backed-up toilet or even a spilled mop bucket can all saturate a floor and send liquids seeping through to the level below. 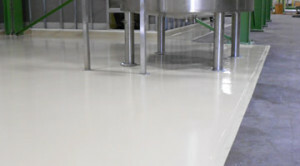 Whether or not upper level floors are exposed to liquids during the course of daily operations, the right waterproof epoxy flooring and coatings can prevent accidents from becoming disasters.